Just for Men hair color is specially formulated to dye gray hair on men. The product helps men regain their original hair color or give them a completely new look. If you do not apply the hair color properly or follow the appropriate precautions, the hair dye can end up on your face or forehead. The hair dye will often dye your skin and leave behind unpleasant blotches. 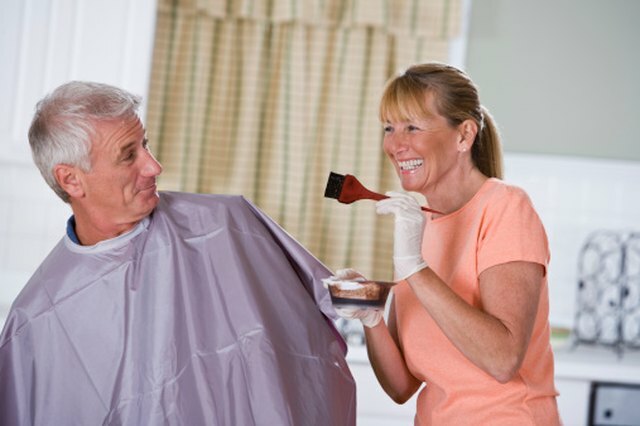 Safely remove the hair dye with items that you have around your home. Apply a facial cleaner or lathered soap to the dye spots on your face. Scrub on the spots with a skin brush carefully to avoid irritating your skin. Blot petroleum jelly over the hair dye stain. Rub the petroleum onto the skin and then remove it with a washcloth. Apply toothpaste to the stains on your skin. Avoid using gel toothpaste because it will not be as effective as a paste. Rub the toothpaste onto the skin and then rinse it off with a damp washcloth. Combine an equal amount of dishwashing soap and baking soda in a bowl to create a paste. Apply the paste to the stained areas of your face. Rub it into your skin and allow it to sit for 15 minutes. Rinse the paste off with water. Purchase a hair dye remover from your local health and beauty supply store. Follow the instructions on the product to remove the hair dye safely from your face. Apply petroleum jelly to your forehead, ears and neck before dyeing to prevent the hair dye from staining your skin. Avoid using harsh chemicals such as bleach or other cleaning products on your skin because they can cause irritation and even illness.